Voice your opinion! Review Leon Restaurants Bankside now. Hi there ,I'm delevroo rider ,I been to Leon Banckside branch to pick up a order ,was few costumer on line I was waiting for my order ,it I was looking at the girl she was behind aconter taking orders ,with big smile on her face and very polite girl ever ,she really make those costumer smile and happy and feeling welcome,after long hard day at work . I took her name and I decided to send a feed back to the conpny her name is Kendra , This is a costumer service how should be Thank you . 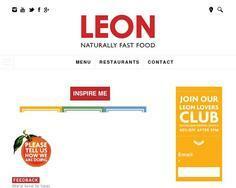 Is Leon Restaurants Bankside your company?